Beauties, I know this is a back to back post on some beauty deals, but I had to share this with you! I missed this special before. However, Googles cyber stalking ads as I like to call it, found me, and now I am sharing this with you! For all you Urban Decay Naked Lovers, this is Christmas in October. What am I talking about? Naked Vault Volume II which is now on sale for $165 at Ulta! Now don’t let the price scare you away as you will be saving over at $100 with this set. (Compared to buying each item individually). So what is in this ultimate Naked eye arsenal? Per Ulta’s website… “They have loaded this coveted ultra limited-edition set with EVERY SINGLE NAKED PALETTE they make: Naked, Naked2, Naked3, Naked Basics, Naked2 Basics and Naked Smoky." Urban Decay has arranged the Naked Palettes in a beautiful collectible case, that has a durable, removable inner tray. The tray can be easily removed so you can store the box on your vanity and/or use the box to store all of your other UD & makeup goodies! So Naked lovers what are you waiting for? Don’t miss out before they sell out of this product! Get your Urban Decay's Naked Vault Volume II at Ulta NOW! Are you over people thinking you are tired, accusing you of staying out all night or worst yet thinking you are older than you are, all because of your bags and dark circles under your eyes? While all of these things can contribute to dark under eye circles and bags, there are also some other factors that can be the true culprit(s) like your age, heredity, pigmentation irregularities and fluid retention, just to name a few. As you can see, there are many reasons why, but are there any remedies for these unsightly under eye imperfections? There sure are, so if you want to find out how you can bag those under eye issues continue reading! My top 5 ways to help minimize those dark under eye circles and puffiness! Cosmetics: You can cover your dark circles by using lipstick and some other cosmetic products. Keep in mind you can’t use any color of lipstick, you need to consider your skin tone. If you have darker skin, bright orange-red lipstick works best when trying to conceal. Why does this work? Think of a color wheel, where colors can neutralize each other. Dark circles usually appear as blue or green. Using a bright orange-red color, which is the opposite on a color wheel, helps to counteract the darkness, hence minimizing the appearance of dark circles. To give your eyes an extra lift from those bags, apply a concealer using the three-dot method, forming a triangle. Two dots, one on the outside of your under the eye, one near your nose/tear duct area to create the base of the triangle. The 3rd dot is used to create the point towards your cheek. (fill all in to finish the triangle). Sleep: Changing up the way you sleep by elevating the head, can help to reduce fluid retention. Hence, you will need to sleep on your back, with your head propped up on a few extra pillows. Your Diet: Avoid salt & drink plenty of water as dehydration causes sagging skin and salt causes swelling. Cold Compresses: Use a cold spoon or a cold washcloth on the eye area. I’ve also had great results with refrigerating some of my Anti-aging eye creams, but be careful as refregiration of some creams can reduce the effectiveness. Speaking of eye creams, I saved the best for last which EYEVAGE, a professional strength, anti-aging eye rejuvenation treatment, by Solvaderm Skincare. I’ve become a big fan of the Solvadern Skincare line as their products are recommended and used by dermatologists and skincare professionals worldwide. Plus they are paraben free! So how does the Eyevage cream help? This multi-action age-defying eye cream was developed to address the varied and complex issues that I have been discussing. The anti-aging serum penetrates quickly to improve micro-circulation in the under-eye zone and lighten unsightly dark circles. Plus its advanced firming complex is infused with healing antioxidants and anti-inflammatories to help minimize puffiness, intensive skin-softening hydration and work to banish fine lines and wrinkles. Bottom line, the Eyevage focuses on the entire eye contour to make it appear visibly brighter, captivatingly radiant, and radically younger-looking, ultimately helping you to conceal and BAG those ugly under-eye issues! How To Use Solvaderm Eyevage Eye Cream? After washing your face, you’ll want to apply a pea-sized amount of the cream and dab around each eye (with your ring finger) following the eye socket area. For best results, I like to apply in the morning and before bed every day to help nourish and maintain hydration. AND DON’T FORGET TO KEEP IT REFRIGERATOR as the coolness instantly soothes and minimizes puffiness! So there you have it beauties, my top 5 ways to get rid of under eye bags and dark circles, until next time! This is a sponsored post written by me on behalf of Solvaderm Eyevage. The opinions are mine. For this weeks, beauty finds it’s all about the hair. Check out some of these amazing Pro Hair deals straight from Haute Looks, they're Hairtastic! There are still plenty of colors to choose from, coming in 19 & 22 inches in length. This is best of my beauty find this week, as these hair extensions normally sell for $2000 and are on sale at Haute Looks for less than $100! Bonus: If you've never shopped on HAUTELOOK you need to! They are always having great limited times deals that are so-oooo Fantastic! Plus, they are part of Nordstrom Rack so their customer service is amazing. Click here to start saving! 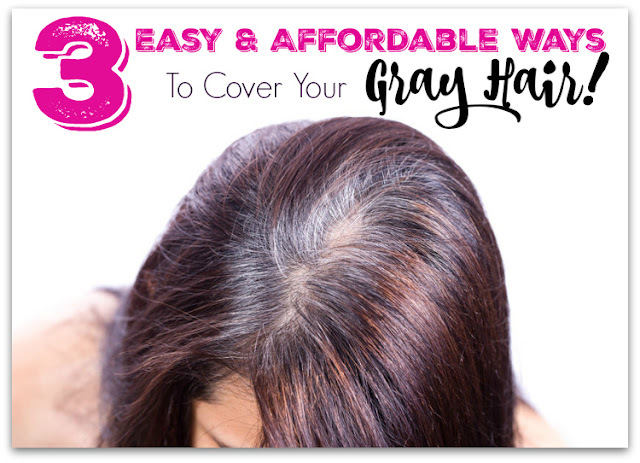 3 Easy & Affordable Ways to Cover Your Gray Hair! Have you heard the expression I’m going to wash that gray right out of my hair? 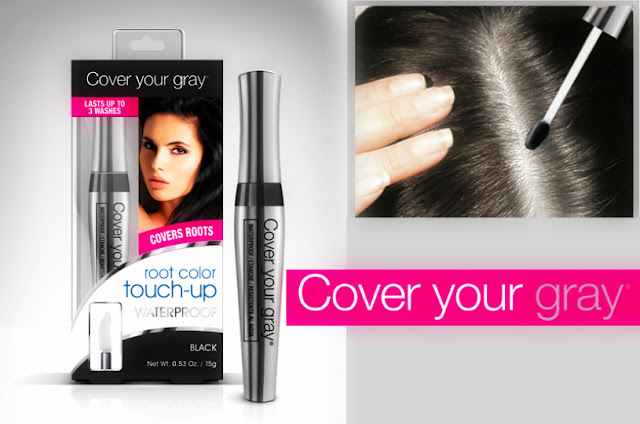 Well today, I’m going to share with you how to brush that gray right out of your hair with Cover Your Gray™. While silver hair is all the rage right now, those of us who have naturally turned gray have a hard time embracing this hair trend, or at least I do! Now I know that welcoming it would sure make my life easier, but I still prefer to cover my gray hair instead of letting it grow out. I, unfortunately, have a lot of gray hair, and with the busy life I lead, I don’t always have time to go to the salon. Hence the time in between hair appointments can be unattractive, especially if you have dark hair like myself. So needless to say, I was excited when I had the opportunity to partner up with Cover Your Gray. 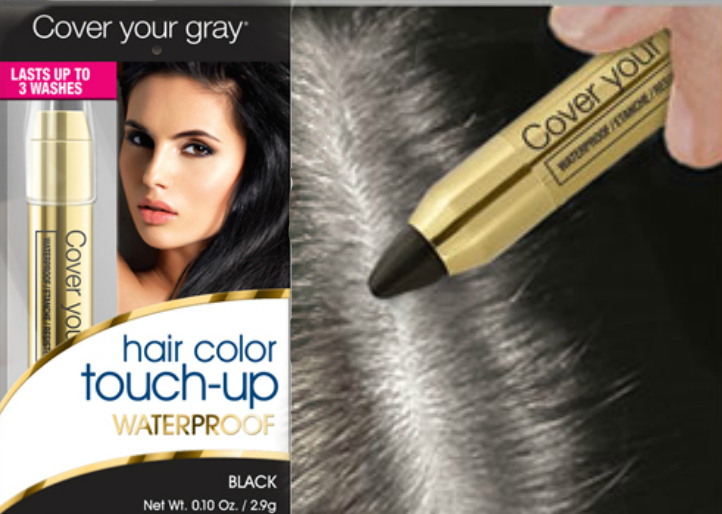 Cover Your Gray™ has launched a new line of waterproof products and I was able to try 3 of them. These products are an affordable way for color touch ups, allowing you to save money by extending the time in between salon services. Before I get into the products, I wanted to debunk some graying hair myths with you, as turning gray at a young age is not fun. Particularly for those, like myself, who are in the beauty industry and spotlight every day. Gray Hair Myth #1: Your Hair Turns Gray. The truth is our hair doesn’t turn gray, it grows that way. According to Better House Keeping, a single hair grows for one to three years, and then you shed it — and grow a new one. As we age, our new hairs are more likely to be white. Every time the hair regenerates, we have to reform these pigment-forming cells, and they wear out! Gray Hair Myth #2: Stress Will Cause You To Go, Gray. Stress won't directly cause your hair to go gray, but stress can cause skin and hair issues. You can lose more hair during a stressful situation, and the color of hair that grows back can be a different color, and in my case...GRAY! So now that I got those gray hair myths out of the way, let me tell you some easy & affordable ways to cover your gray hair, with these three amazing products I’ve been using. 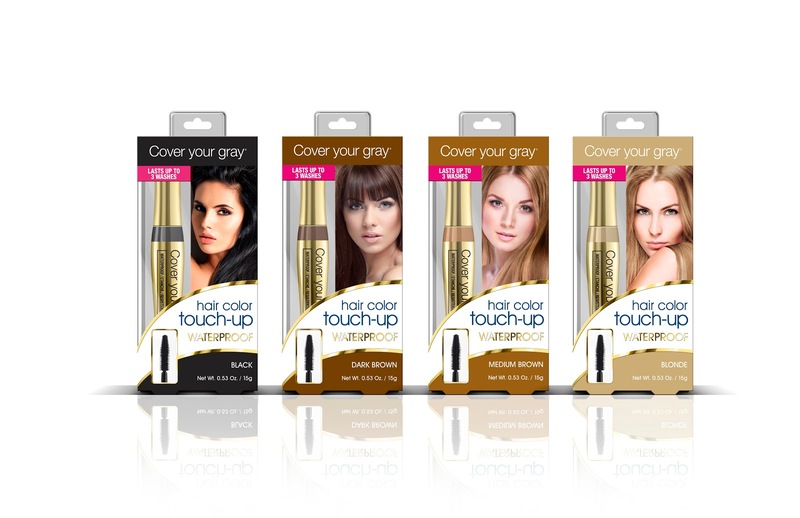 They are waterproof, sweat-proof, rain-proof and last through three shampoos. Additionally, this line comes in 4 color options which are Lt Brown/Blonde, Medium Brown, Dark Brown and the color that I used, Black! All 3 of these blended beautifully allowing for the most professional result at home! All of these touch-up gray applications are great for areas that need a heavier coverage as well as for re-growth in the temples, part or around the forehead, basically an all in one solution! The applicator is very easy to use. At first glance it reminds me of a lip gloss brush and applies effortlessly. Apply with short strokes to your gray roots at the hairline and parting line. Comb your hair after the application to blend with existing hair color for a seamless, natural look. Allow a few minutes to dry. The applicator looks and works the same way as a mascara wand. 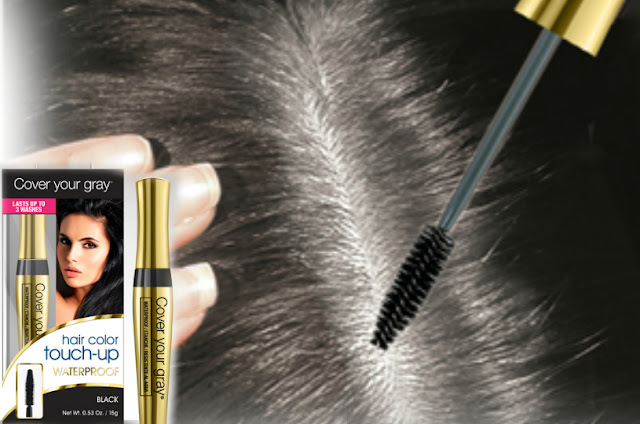 See below how to use this root touch up brush. FOR SHORT HAIR: Dab on using short strokes. FOR LONG HAIR: Hold a section of hair and apply from the root to end of your hair. After using the color, brush through to even out finish. To remove, just shampoo your hair. This is one I have never seen before, but loved it. It’s like a crayon that covers your gray hair! You want to apply with short strokes to your gray roots at the hairline and parting line. Comb hair after application to blend with existing hair color for a seamless, natural look! So there you have it beauties, three easy & affordable ways to cover your gray hair! This is a sponsored conversation written by me on behalf of Cover Your Gray. The opinions are all mine. How about this for a Sunday Funday? Urban Decay’s Friends and Fanatic Sale is going on! 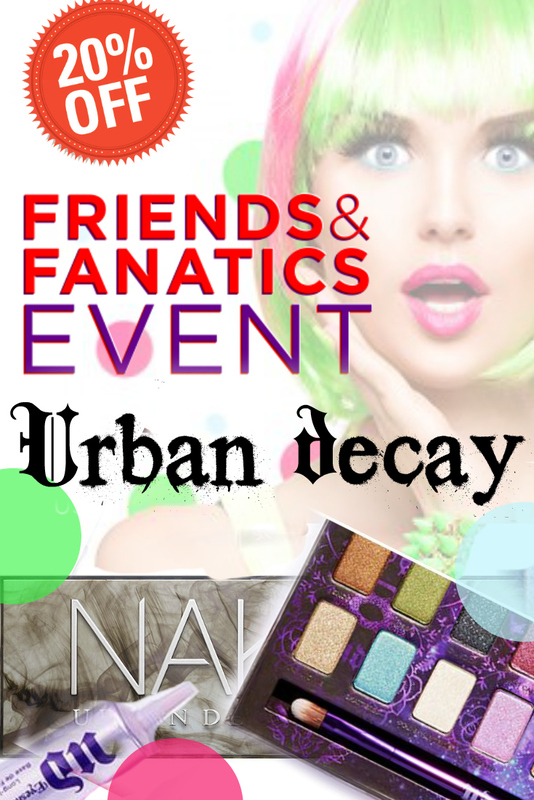 Now until Monday, October 12, 2015, you can get 20% off on the Urban Decay Website, for their Friends & Fanatic Event! And beauties if that wasn’t enough, you also get free shipping for purchases over $35.00 when your enter in the code TAKEITOFF . If you are like me, there are some great Urban Decay makeup palettes I’ve been wanting, like the Vice Palette 4 that will now be only $48! It's like my own little Christmas in October! Bonus: You get a Urban Decay free deluxe black velvet with all purchases! Restrictions: Limit 5 orders per SKU and cannot be combined with any other offers. 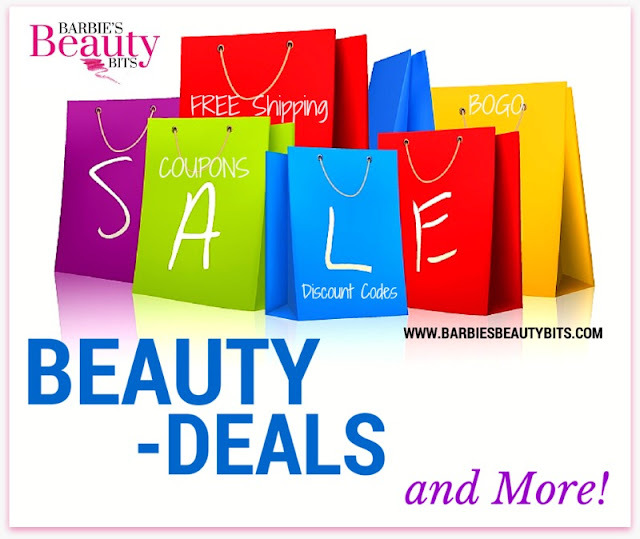 Know of any other beauties deals? Let me know and I will share them and reference you for sharing!